Create documents from scratch, or a template. Research a topic and find credible sources. Access your documents from a computer, tablet, or phone with OneDrive. Share your documents, and work with others. 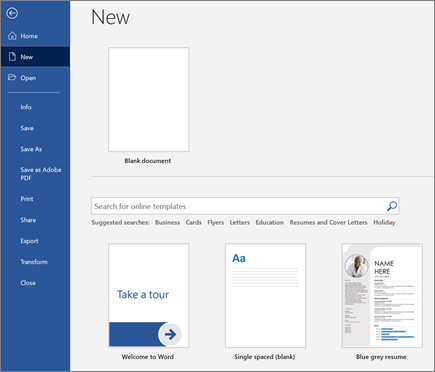 In the Search online templates box, enter the type of document you want to create and press ENTER. Tip: To start from scratch, select Blank document. 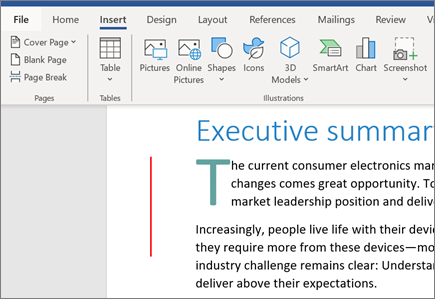 Or, for practice using Word features, try a learning guide like Take a Tour, Insert your first Table of Contents, and more. Place the cursor and type some text. Pictures - select Pictures, browse for the picture you want, and select Insert. Shapes - select Shapes, and then select a shape from the drop-down. SmartArt - select SmartArt, choose a SmartArt Graphic, and select OK. Chart - select Chart, select the chart you want, and select OK.